Today’s picture is the perfect metaphor for my life. 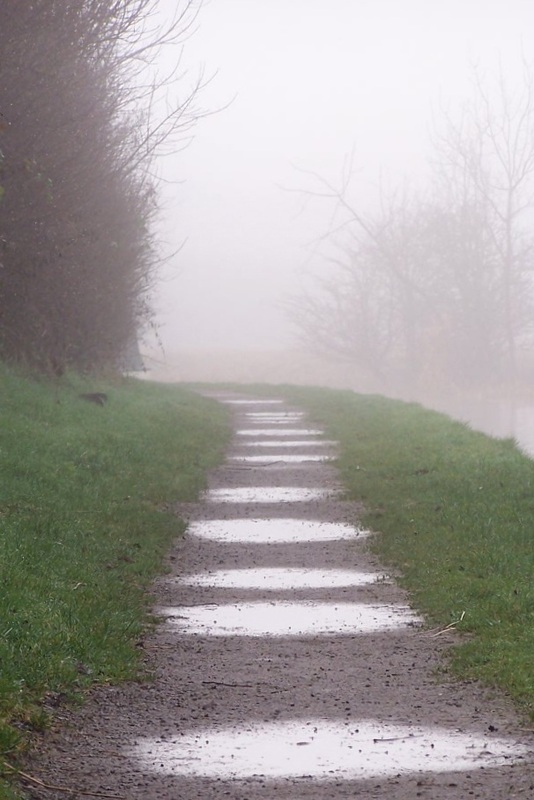 The canal path represents the last few months we have left here in England, and the puddles are the finite number of adventures we can cram into that time. Ahead, the gravelled footway makes a sharp turn, marking the day when our plane departs Heathrow and flies across the pond for the last time. Beyond that lies a fog of uncertainty. What kind of job will I pursue in the States? Will I be happier with the Korean SUV or the American one? Where will we lay our heads each night, and will it mean adding another mortgage to our collection? Should I splash out for a new smartphone or resurrect the old RAZR? How many times per week can I eat Chick-fil-A before someone stages an intervention? I’m not very good at letting the future take care of itself–I like to have at least a general idea of where I’m going, so I fret and worry and plan and scheme. Past experience tells me that despite all this effort and the best laid plans, I often end up having to just go with the flow anyway. If I waste too much time and energy trying to guess what’s hidden in the mist around the bend, I’m going to miss what’s right in front of me. As we get closer to the turn, the fog will clear and bit by bit we’ll have a better perspective on the trail, its forks, and its obstacles. Until then, I’ll just pull on the old wellies and splash in every puddle the current path reveals! Enjoyed your metaphor! It remains me of my life. But I have stayed in one continent.